Always a lover of horses, Pam Hester got her first American Saddlebred in junior high: a hot, liver chestnut mare named Misty who captured attention wherever she went. Pam's mother bought Misty from a horse trader in Riceville, Iowa. 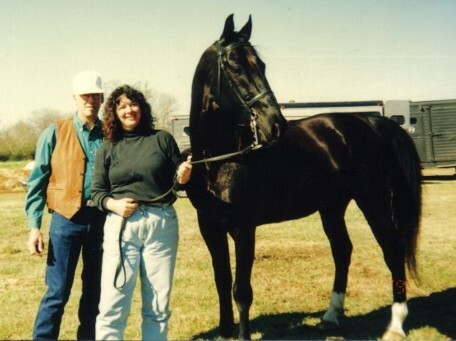 Singlefoot Farm was established in the mid-1980s after the acquisition of our first Saddlebred, a retired 5-gaited gelding named Wild Crescendo for Buddy to ride endurance in style. Not to be outdone, Pam acquired Dancer, a Saddlebred, through a local horse trader with the intent to compete on 35- to 50-mile rides. This mare turned out to be Fortune Town sired by none other than the great Yorktown out of a daughter of Beau Fortune and Dress Rehearsal. She was a hot number to say the least. No walk in her. Out of nowhere and not on the radar, a friend introduced us to a stallion suffering and listed for sale on the south side of Houston. A stallion was not in the plans! But we could not leave this bag of bones with long stringy brown hair, limping from stone bruises standing on rocks barefoot. His eyes were empty, pleading for someone to help. So “ Jet” as we called him came into our lives when he was 13 in 1991. We lost him in 1998 at the age of 20 to colic. Jet was by Supreme Rullah, a colt from Valley View Supreme and Dixie Heiress, a daughter of the immortal Wing Commander. Jets dam was Swamp Angel’s Firefly going back to Stonewall King, Rex Firefly, Kalarama Rex and War Cloud. The black saddlebred pictured above is Pentium, Jet’s last son, who we lost in 2018 at the age of 24. In 1995 Pam sent Fortune Town to Oklahoma to be bred to Pride of Ridgefield– the ensuing colt named Preaux ( to combine Pride and Beau and throw on the x, that’s what they do down here in the south!) It is pronounced Pro but no one can say it– go figure. Preaux is beautiful and talented shown in Fine Harness. He stood here and then at Capps Common in TN and now is back north TX in 2018. Preaux was featured on the front cover of Equus Magazine Sept of 2012. Fortunately or unfortunately, an acquaintance called Pam one day stating she must go with her to see an American Saddlebred stallion she had heard may need to be rescued. Always ready for a horse adventure, Pam jumped at the chance (but thinking, "Why would I want to go look at a stallion?"). She visited this pathetic, long-haired, rough brown 16.2-hand creature who could not take a step without limping due to standing on rocks with hooves worn to nothing, and with every bone in his anatomy standing out from his disgusting coat, but with eyes that said, "Help me..." A price was negotiated and Pam found herself on the phone that night making arrangements to place Jet, as he was called, in a 25-acre pasture with a few cows, a large tank, feedings twice a day, and all the hay he could eat as well. Jet was delivered within a few days, and Lord knows how these people ever got him in the trailer as he was sticking out both ends – literally! Pam had forgotten how bad he really looked until he unloaded, Then she wondered if he would even live, since he was so depressed. A short 90 days later, after numerous worming treatments and good, old-fashioned freedom and food, he was a sight to see! He was exactly who his papers said he was! Midnight Mirage is what we renamed him from Jet Black Supreme 59. Somehow that name did not seem to fit, but about six months later he bloomed to be just that: jet black!